Leading Manufacturer of magnetic corner tracks from Ankleshwar. Corner Tracks are made out of wear resistant UHMWPE material, We manufacture magnetic tracks and tracks for tab chain and bevel chains. 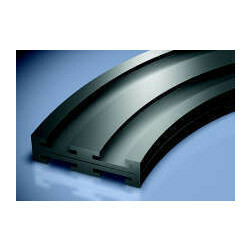 We can offer tracks in various center radius. Corner and Straight track are designed to work with flat-top conveyor chain. Our UHMWPE Corner Tracks are cost effective, chemical resistant, and suited for dry or wet applications.